When I went thrifting some time ago I bought a bag full of old wrapping papers. Some were absolutely lovely, like the ones in the photos below, but, apart from a set of labels and other mini curiosities, there were some little surprises neatly tucked in. And if you are a fellow thrifter you probably agree that it is these hidden treasures that would make your day! And the cutest Merry Christmas paper ribbon wrapped around this stylish “Regal” Santa card, complete with a “Make your gifts gay” slogan! Oh, how lovely it was to find something I hadn’t expected! 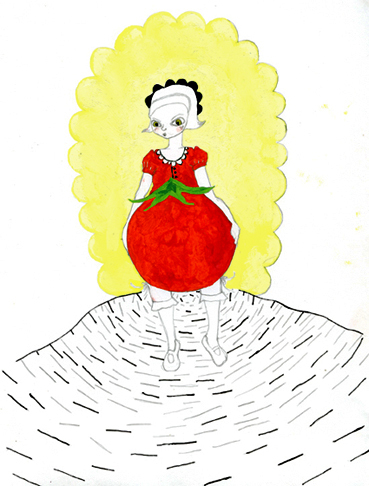 Apart from my regular thrifting I have also had the time to do a little shop updating and the original drawing of this slightly startled looking Tomato-Girl-Tomato is now available in my Etsy shop here. Now I’m looking forward to decorating my new cardholders which is great, since, in true Swedish tradition I am not to decorate my christmas tree until the evening before Christmas Eve and I have a lot of decorating itchiness in my hands. I will see you soon, I hope, until then; A Very Thrifty Christmas!